Performers include: Mike Henry, Sanaa Lathan, Kevin Michael Richardson, Seth MacFarlane, Nia Long, Jason Sudeikis, Seth Green, Arianna Huffington, Alec Sulkin, John Viener, Reagan Gomez-Preston, and Aaron Krebs. Created by Seth MacFarlane, Mike Henry, and Richard Appel, this animated sitcom is a spin-off of Family Guy. Cleveland Brown and his son move from Quahog, Rhode Island to Stoolbend, Virginia, Cleveland’s hometown. Back when Cleveland Brown (Mike Henry) was in high school, he was in love with Donna Tubbs (Sanaa Lathan). She wound up marrying someone else, but he told her then that he would always love her, and if this other man ever did her wrong, he’d be there for her. The other man eventually ran off, leaving Donna with two kids; teenaged Roberta (Nia Long) and five-year-old Rallo (Mike Henry). 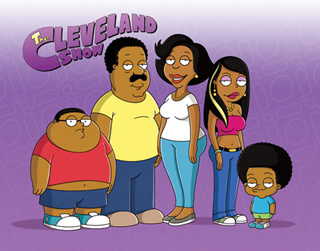 Cleveland comes back to Donna and Stoolbend, bringing with him his own son, 14-year-old Cleveland Jr. (Kevin Michael Richardson). Older, Donna is now more open to a relationship with Cleveland, and the two finally wed and create a new family with their three kids. Their neighbors include anthropomorphic bears Tim and Arianna (Seth MacFarlane and Arianna Huffington); hipster wanna-be Holt (Jason Sudeikis); and a loudmouthed redneck named Lester (Michael Richardson). Episode #88 — Wheel! Of! Family! Cleveland and Donna become overwhelmed with the kids’ hectic schedules. They decide to get everyone involved and create a spinning wheel with the kids’ activities. First aired: May 19, 2013. What do you think? Do you like The Cleveland Show TV series? Do you think it should be cancelled or renewed for another season? I love the show! Bring it back! I really liked the Cleveland show an wish they wouldn’t cancle it!! “Aww.. Just read that the Cleveland Show was cancelled!! At least give “The Cleveland Show” a great sendoff..
All though not on FOX’s fall schedule, FOX hasn’t said that has officially been cancelled.